An action figure based on a Peter Gabriel song? What madness is this?! In the Elseworlds's [sic] storyline Batman & Dracula: Red Rain, Batman investigates mysterious murders involving the homeless of Gotham City. He ultimately traces the gruesome killings back to an underground ring of vampires, led by the infamous Dracula. Although the Caped Crusader possesses superior strength, wit and weaponry, no mortal can compete with Dracula's undead ferocity. Tanya, the leader of a rogue group of vampires, bites Batman's neck, giving him the vampire virus and granting him the strength to compete with the dark prince of the underworld. Never ones to leave well enough alone, DC followed Red Rain with two more stories that chronicled the continuing adventures of vampire Batman: Bloodstorm and Crimson Mist. All three volumes were drawn by Kelley Jones, a guy who definitely has a distinctive style, one this figure only reflects in the face: it's thin and sunken, with huge fangs, beady red eyes, a furrowed brow, and ears on the mask that doubles the height of the head itself. Below the neck, Vampire Batman uses the "skinny male" body, which was probably chosen because it seems the most "undead" of the bunch - after all, they also used it for Deadman and Black Lantern Abin Sur - but it really doesn't reflect Jones' artwork. His Batman, even as a vampire, was a thick pile of muscles; not quite at Frank Miller levels, but still bulky (the exception being in Crimson Mist, where Bats had been dead for a while and thus was nearly skeletal). He gets Creeper's hands, new forearms, a new utility belt (to fit his tiny waist), and a new chest with striated muscles and holes in the back for his wings. Yes, you read that right, wings. They only appeared in a few panels through the series (he usually just used his cape, like always), but if you're making a Vampire Batman figure, they're a handy way to show that without leaving any question in our minds about what the intention is. The wings are packaged separately in the tray, and plug in beneath his cape - don't worry, it's molded out be out of their way (mostly). Getting the right angle to pop them in can be tricky, but it's not hard to actually get them into the sockets. They're dark brown, and sculpted with a leathery texture. The wings swivel where they enter the shoulders, adding two to the usual tally of joints. It's nice that this body gets the double-hinged elbows, and the swivel/hinge wrists, but the knees are just single hinged, and the ankle joints feel gummy, like they don't want to move. 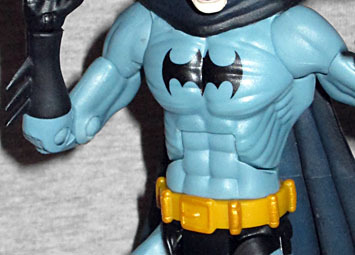 Also, the chest joint won't allow the figure to bend forward for some reason: he can arch his back, but not bend over. The up/down motion on the neck is pretty good, for a change. 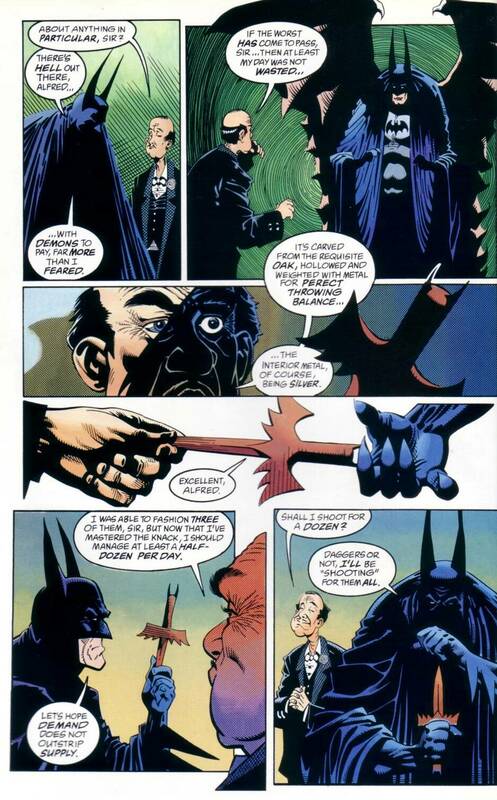 In addition to the wings, Batman has one accessory: a throwing dagger made for him by Alfred (and only seen in Bloodstorm). Supposedly carved from oak and weighted with silver, it should really have a wood grain sculpt, rather than being perfectly smooth. The paint is nice, giving a little bit of a dark airbrushing along the lower edge of the "wings" to break up the brick red of the piece. 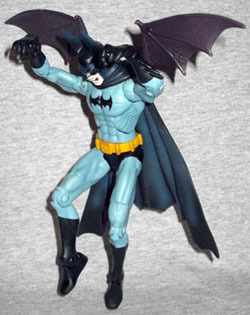 Unfortunately, because of the design of Batman's hands, he can't actually hold it like he should. 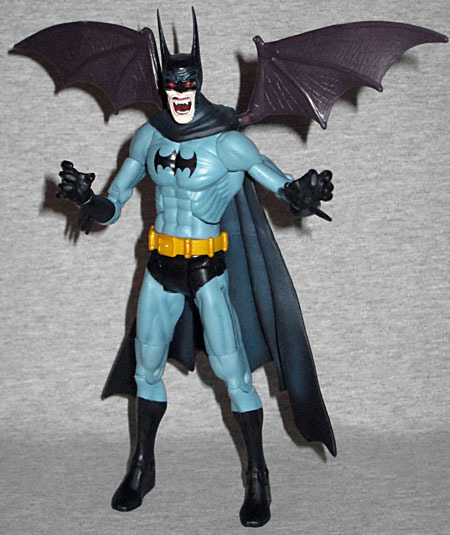 Vampire Batman is exactly the kind of so-so action figure you expect from Mattel, but he presented an interesting new direction for the line to take. Come on, Elseworlds action figures at mass retail? How cool would that be! Unfortunately, the line seems to have ended. Maybe we'll see something at Toy Fair in February, but for now, it's time to put a stake in them; they're done.